Can I make this in the Instant Pot? Has anyone tried? I’ve tried it with both chicken and shrimp. Slightly easier to make with shrimp (if they are already peeled), and I like shrimp more than chicken in general. But both versions are delicious! We snip fresh basil on top when serving. Yum! Note: When using shrimp, I saute them most of the way through before removing from the pan to make the sauce. Then I finish them off in the sauce. Forgot to leave my rating in previous comment! I added some crushed red pepper which gave it a nice kick! How long do we add the chicken back to the pan for? If we add it and serve it right away, I worry it wouldn’t absorb the sauce at all, and there wouldn’t be much point, but I am also afraid of overdoing it, too. 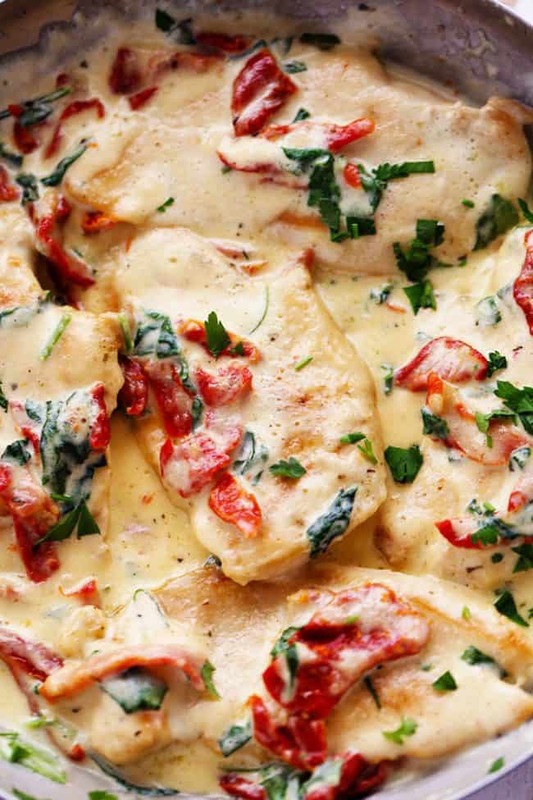 You are mainly adding the chicken back in to coat with the cream and serving. 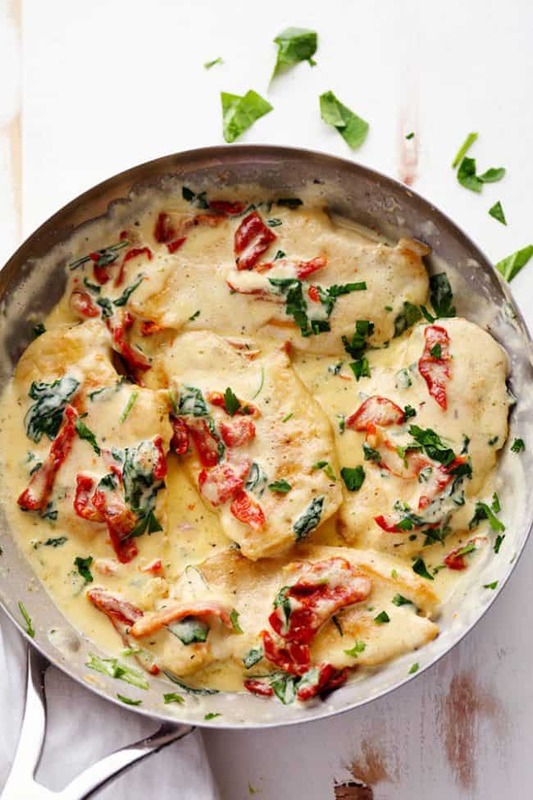 I LOVE this receipe,but i think the sauce is to watery.any ideas on how to thicken it up? You are welcome to add more parmesan cheese. Sometimes just cooking it a little longer can help thicken it up. You could also leave out the chicken broth. A similar recipe doesn’t include chicken broth in the ingredients. Either way, it’s a delicious recipe….love it! I think next time I’ll use half the chicken broth. Still a very delicious meal. I substituted sweet peppers in place of sun dried tomatoes. And a side of Zucchini Zoodles!! This recipe is delicious! I did thicken the sauce up a little with cornflour and used 3 cloves of crushed fresh garlic rather than garlic powder and served it with cauliflower/broccoli/kale rice… highly recommend it! 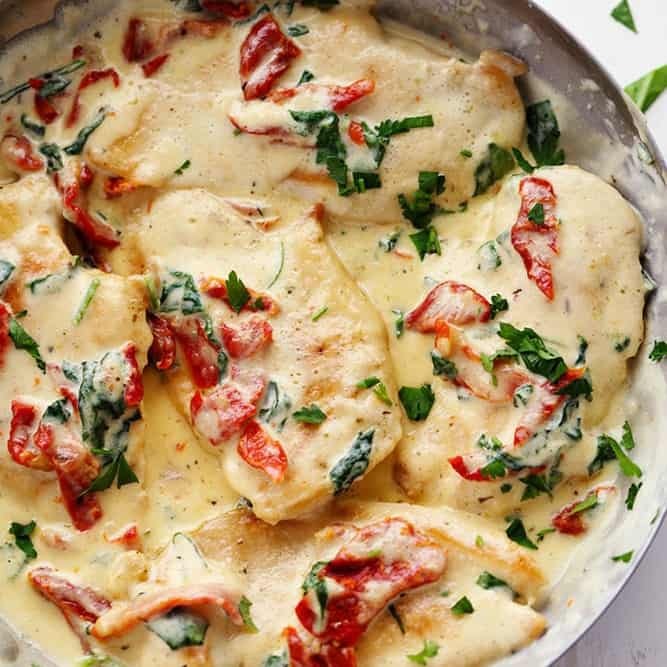 Love the recipe for creamy Tuscan garlic chicken and want to make it for a family birthday party however some are allergic to milk. What would b the best non dairy substitute for the heavy cream for this particular recipe? You can substitute the diary for oil to keep the thickness. What? lol. You want them to use 1-cup of OIL for their sauce? I am not sure where you see oil or 1 cup together. There is olive oil for 2 tablespoons but and 1 cup of heavy cream but other than that there is no 1 cup of oil. I hope that helps clarify and here is the list of ingredients for you with their measurements. She saw ‘one cup’ and ‘oil’ together when you told the previous commenter to replace the dairy with oil. I typically use my myfitnesspal.com or skinnytaste.com for nutrition facts. Thanks for following along with me! Mashed potatoes or rice would also taste great! Let me know what you think! Thanks for following along! I used cauliflower and it was delish! Can I use boneless, skinless thighs instead? This recipe does have Nutrients Facts anywhere. I’d like to know how many net carbs per serving. Can you please supply the nutritional/macros information? This was AMAZING!!! Will make again. Made with cherry tomatoes instead and bow tie pasta. Married well with a side salad with avocado and parm cheese. what are the nutrition values: calories, carbs, fats, proteins, etc???? This was super easy, so yummy and a fam favorite. I served it over zoodles and it upped the veggie game of this dish. It will definitely be put on the rotation. The sauce was perfect. You do have to keep stirring to allow the heavy cream to thicken but take your time. It was worth it. Im so excited there was left overs so i can have it for lunch. Two thumbs up!! For someone who cooks dinner every night for my family something new is always desired. Let me tell you this was easy to make and was delicious!!! Will be making again! This was amazing! My 5 year old had seconds and licked her plate clean! We served it with zucchini, which tasted great in the sauce. I also used fresh garlic, and some extra parmesan. Do I use fresh grated or the powdery parmesan cheese? Freshly grated is always better! The powdery stuff is very dry and I find it never melts into a sauce in the same way. This recipe is a Must Try! Delicious and easy! Tonight I just made a very similar recipe with salmon and it was absolutely amazing. It did not use chicken broth although it would have added another good flavor and I did think about it. But I did add extra Parmesan and after I turned off the heat and let it sit the sauce did start to thicken up more. I can’t do carbs so we ate with veggies. 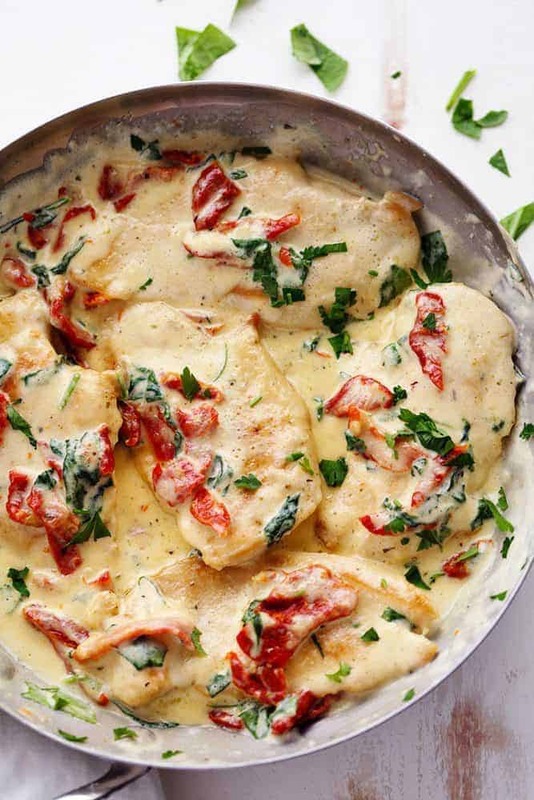 Husband and I can’t wait to try this variation with chicken! Fantastic!!! Serving it with green beans and zuchinni noodles! !Flavor was amazing! I’ve made this multiple times for the family now and its #1 on the list. Great recipe. Thanks!!! Amazing! thank you! I made it exactly as the recipe said and I did according to the comments I added some cornstarch to the cream sauce prior to cooking. I tripled the sauce and added 4 tablespoons of cornstarch which was perfect. thank you again for the spectacular recipe! My family loves this recipe. I use freshly grated parmesan and toss in extra, lots of fresh garlic and I double the sauce every time. I’d triple it if serving over pasta. We serve it over steamed broccoli. Any thoughts on 2% milk instead of heavy cream? 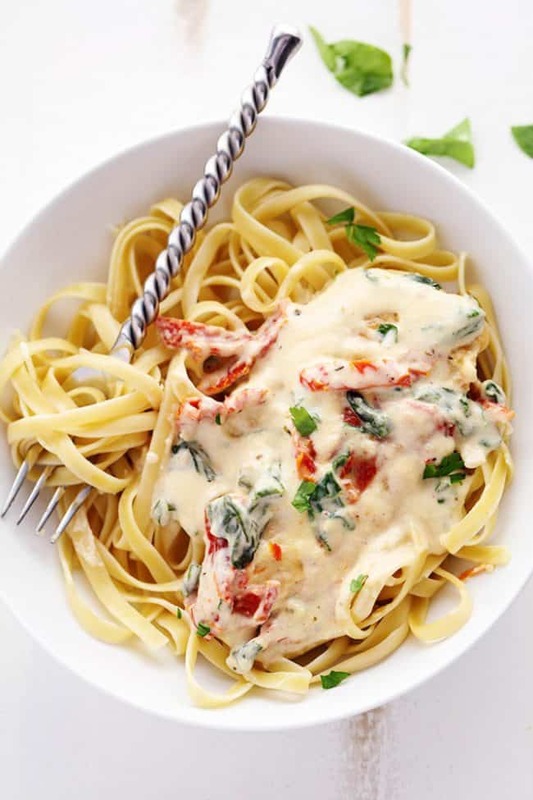 I would recommend heavy cream to keep the thickness and enjoying the flavor more in the sauce. Enjoy! What do you recommend on the sundried tomatoes? The ones in a jar of oil or a package of dry ones? Either is great! I prefer in a package but the jar of oil is a little quicker. Hope that helps and you enjoy your meal! Sounds great! Fresh or frozen spinach? Sun dried tomatoes –dried in a package or the ones in a jar of oil? Can you tell I’m not a cook?? I prefer fresh spinach. Sun dried tomatoes in a package or jar is great too. You can use the frozen spinach it may take longer for you to cook though. Just add a few extra minutes. You are great! Questions are great and the way we all learn. I know this is a great, simple recipe that you will master and love. Thanks for following along with me! Yes, that will work great too! It is already soft and tender so you will not need to cook as long. Hi I’m trying to lose weight on the keto diet and am only just starting this diet and can’t wait to start losing weight. That sounds great! Good luck with your journey! Trying to prep a bunch of meals before baby#2 arrives. Do you think that I could freeze this and reheat in a month or so? Yes, this is great to freeze for about 2 to 3 months. Hope that helps and congratulations on your new baby! Could you use this recipe with a crock pot? Yes, this would work great in a crock pot! I’ve made this for a few years. I use fresh garlic and no Italian seasoning just fresh basil before serving. My daughter and husband love this. It’s a 10 star recipe! Simple and so tummy!!!! I added small slices of jalapeños for a little spice. It came out delish! Calories 368, Carbs 8, Fat 19, Protein 40, Sugar 4, Sodium 100…. pretty good if you are counting calories!